The plane was descending into San Francisco. It was one of those days when the clouds were thin and patchy. This was not a destination; it was a stop along the way. The uncertainty of everything was flashing through my mind as the verse above was playing through my headphones. While I am not really a fan of Christian music, that revised last verse from the Chris Tomlin version of Amazing Grace was powerful as we entered that final descent, an experience that always makes me a little anxious. It was the end of the second flight of a three-flight day, and I already had plenty of time to reflect. It has been a challenging time for me lately–maybe it was that I was not exactly looking forward to the 23 hours of travel time, maybe it was that my youngest daughter is getting married, maybe it is the pretty obvious anxiety I have been carrying this late winter and spring. If I am honest, China has never been on the list of places I would like to visit, and as we were chasing the sun to that place on the complete opposite side of the world, all of the propaganda about air pollution and all of my own stereotypes of what it would be like to visit the most highly populated country in the world were flooding my mind. But, when your daughter majors in Mandarin, falls in love with a Chinese guy, and moves to the People’s Republic of China, a trip like this is bound to happen. And to be honest, the sun has yet to shine at least so far and I have never been in a place with so many people in my entire life. I am finding an odd sense of connection that I was not anticipating, in a place where I am not only out of my element, but I am also unable to verbally communicate. We spent the evening with Kaia’s husband’s parents. The food, which was obviously “comfort” food to them was exotic to us (but if you know me, I like exotic when it comes to food!). We have a couple of English/Chinese speakers in our midst but direct communication has been impossible, still I have always known communication has to do with much more than what you say to one another. So I feel connected in ways that I was not really expecting. On the other hand, my phone rings every once and a while, and though I let it go to voicemail, it always is someone back in the Midwest who has no idea that I am on the other side of the world. I electronically followed to Tripoli Jr. High track meet from Chonqing, China (I am thinking I am the only one to have done that). Dealt with a couple of work related things. And posted pictures for a wide group of friends back in the USA to see of what we did today! In the end, the world has gotten a lot smaller and more connected, both in general and for me specifically in the last few days. Of course there is something lost in all of this, it is getting difficult on to impossible to truly get away from it all. On the other hand, connections have become global, right now and for me literally. It is not really a matter of whether this is god or bad, it just is. For a bunch of reasons, I started running again this past fall. True to how I usually start up this sort of thing, one day last September, I was having a bad day (actually I had been having a bad month) and I decided to do something that I have done before. I started running again, and before I was done that day I had run 10 miles. It was further than I should have run. The next week I logged over 50 miles. I know this is the way runners injure themselves, but still given my mental state, I was needing to push beyond what was reasonable. There is one thing about being bipolar that has become clear to me over the years. There is precious little that is reasonable in my life. 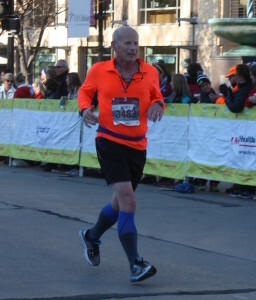 Coming into the finish at the Madison 1/2 marathon in November 2015. Maybe it is because I am interested in too many sports—paddling kayaks, canoes, and stand up board, skiing, swimming, and biking in 4 different varieties—road, mountain, gravel, and fat. Running has always been there too, a few marathons but mostly in support of my other athletic pursuits I usually need to have a goal to keep me running or riding or paddling or whatever the current sport of interest might be. Unless there is some race in my future I just don’t prioritize my training. This fall was different. Never have I trained this fast, never this far, never this much, all without a race in mind. The Madison half marathon that I eventually did decide to run in mid November was the fastest I have ever run. The fastest ever! And at 58, no less! I have never been fast especially as a runner. In fact I have always had to define my races by my own standards, the middle of the pack athlete that I am. It is a strange thing to be 58 years old and trying to run faster than you once did. I have entered the age of diminishing returns when it comes to athletics. I have been bucking that trend just lately. I have a coach and a plan, looking for PR’s wherever I can find them. I am not sure why actually. Maybe it is some deep-seated denial that I am in the midst of a ¾ life crisis, when I look at pictures of high school class mates on Facebook and I see images of senior citizens. I am not ready for that. The world has changed. I recently found an old training log of mine from the 90s. What I noticed was that the entries were much more subjective. Now, when I hit a button on my GPS watch and all the data, heart rate, speed, elevation, grade, all go directly to my phone and from there is directly emailed to my coach. So pretty quickly when I sent him my data last fall he pointed out—too much of your training is in the “gray area,” my slow paced runs were not slow enough and my high intensity runs were not fast enough. I think the reason I ran that fast did not have much to do with training. It was because that is how fast my training partners were running and I had to stay with Ally and Michelle. But maybe even more than that, it was because when I run in zone 4 or 5, I am able shut down the flow of feelings that so often side track my life. The flow of feeling that was really sidetracking my life last fall. I am 2 ½ months out from my next marathon. The fancy graph that TrainingPeaks produces to show my general level of fitness indicates that that I am not in quite as good of shape as I was last November, but the graph is headed up. The probably not so good estimate of my VO2 max that my watch calculates based on who knows what, has been climbing as well. I have no idea how the marathon will go this time around. The last time I trained for Grandma’s Marathon, I came up injured a month or so before and had to abandon it. After that, I pretty much assumed I was done, but here I am again with a 20 mile run scheduled for Saturday.